Emerald Media - Cabin completion underway on two Falcon 8X aircraft. The Dassault Falcon completion facility in Little Rock, Arkansas, USA, has welcomed the first two Falcon 8X aircraft for cabin completion. 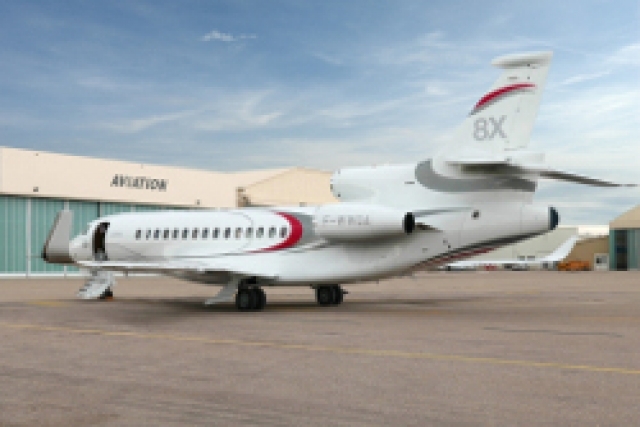 The first aircraft will be used for the 8X cabin comfort and functionality test program, as well as an operational test campaign to demonstrate reliability and performance in different flight conditions.The second aircraft will be the first production unit to be delivered to a Falcon customer. Unveiled at EBACE in May 2014, the latest addition to the Falcon business jet family rolled out on December 17, 2014, and made its maiden flight on February 6, 2015. EASA and FAA certification is anticipated for mid 2016, with initial deliveries in the second half of 2016. The Falcon 8X is derived from the Falcon 7X and will offer the greatest range and the longest cabin in the Falcon line, along with an extensive choice of cabin configurations. Click here to read a feature on the Falcon 8X, published in the April 2015 issue of Business Jet Interiors International.